I love old doors. We seem to collect them as we move over the years. Shutter style and paneled doors have so much charm and personality. While there are loads of ideas for how to use doors creatively, this idea is is really fun and practical too, especially if you really want to use them as doors. While old doors look really cool, they don’t always fit existing doorways. Unless you get lucky and the door measurements can be modified to fit an existing frame, it isn’t always easy to work an old door into an opening. 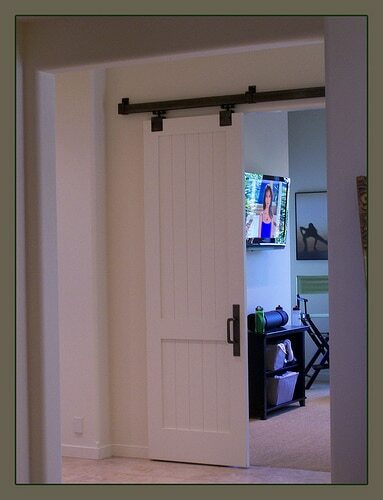 However, with the addition of some barn styled door hardware, you can hang doors on the outside of your doorway! Not only do they add a charming and artistic feature to your room, you can slide them shut for privacy. This solution also saves space — doors that swing out require a lot more room. So, there you have it! Another fun way to use old doors! What are your favorite ideas? I usually only see modern styled doors using this mechanism. I really like the old world traditional look. I like old doors, too, Melissa. I love the use of barnstyle hardware, seen in the photos. That sliding door idea is just so neat! It’s going on my list of things to do/try when we actually buy our own house! I love the idea of sliding doors. But pocket doors aren’t doable, unless they came with your house. This, on the other hand, is doable!!! You just keep showing us one great idea, after another. Thank you Hon. Miss Mari-Nancis last blog post..Hooray!!! I’m so glad you posted this because I want to do this effect with my pantry door, but I didn’t know what it was called. Now that I have a name, I can actually do research on it. Very clever! It would be great for a tight space where a door would normally take up room! I love coming to your site and being inspired! I love this idea, it’s a twist on the old pocket doors. I love old doors. We sell them in our shop. They are great just leaning on a wall with something hanging on them. Love your ideas. I love your site. I am a new reader and stumbled upon you from the Nester. The door idea is marvelous. I’m addicted to old doors as well but have no idea what to do with them. Have you ever done a post about making tables out of old long doors?? I LOVE old doors and this is a great use for them! I’ve also seen them used as desks or sofa tables with glass on top. I really love that too. Kaceys last blog post..My 100th Post! I have always wanted to do that. Fantastic looking. Just wanted you to know that I’m loving your blog lately. Each post has been great and I love how you’ve been taking a specific area of a home and showcasing it…beautifully done! thanks! The place that I’m living in right now- has nothing but old doors- love them- there’s just something about how they made a room feel- adding lots of character- I just posted some pictures using an old door as a backdrop to a make shift linen closet. If it wasn’t decayed (my luck, LOL), I had planned to finish up an old wooden door that was left in the shed when we bought our house. It has lots of rectangular glass panes in it, and I was going to hang it horizontally above a writing desk in our living room, adorning it with some pressed flowers and black and white photos behind some of the glass panes. Ahhh, doors, I love ’em! Except when they’re rotted and your good decorating idea tortures you for years, LOL. This reminds me of the doors I saw on an old barn once that were on a similar slider. Never thought of doing this inside before. Great idea! We looked at a loft to buy several years ago that had barn style doors leading to the bedroom and I absolutely LOVED it – husband did not. Another idea I’ve seen for the use of old doors is to use them as headboards. You can either do two side-by-side, or hang three horizontally, stacked on top of one another to create a very large, wide headboard. Oh thank you!! This is the most perfect idea for my bathroom, which needs a door and we just don’t have the space for one that opens. I love old doors, I am off to find a barn styel door to fit! Cool – I had to go and look at some pre-hung new doors this last weekend and I liked the ones that had that shutter style too. Julie Sizes last blog post..I Decided to Un-Bite My Tongue! How cool are those doors? I think I may have to look into using that idea at our little cottage up north. It could be perfect dividing a section of the basement into a little guest bedroom. Thanks!! Sher’s Creative Expressionss last blog post..Bedroom Project Started ~ Interrupted for Hospital Stay!!! I absolutely LOVE using old doors/windows in projects. In college, I found old plantation shutters and turned them into a divider for my studio apartment. My husband and I “confiscated” several old barn doors and barn window shutters last year; he’s in the process of turning one of the doors into a coffee table. This post is PERFECT for me right now. I was just telling hubby how I would like to do something like this for our closet. We have just begun gutting our bedroom and the old 1971 metal bi-fold doors are LEAVING. I would love to have doors like these. I love this idea! I wonder how hard it would be to talk my hard working husband into it? He sometimes sees these things differently than I do…but I love it!!!! Becky K.s last blog post..We are Sooooo Back! Oh, they’re AWESOME!! Gives me an idea for window treatments for my sliders–sliding shutter doors. So cheap and cute. Now for the sliding mechanism. Hmm…that might be a challenge. Love the old door idea. I’ve just “released” to the wood pile a very old buffet cabinet that was falling apart and beyond repair, however, I removed the old doors from the buffet and think that a wall spot display will serve the memory well. lylah ledners last blog post..MOMS Help 911 – sweet or stinky fruit? Bella Casas last blog post..You’re Invited To A Pretty Your Pumpkin Party!!! What a fantastic use of old doors. columns to corbels to old shutters. They really add interest and character. Thank you for another great idea. Oh wow, it that ever cool! I haven’t seen those sliders before- that is great! How cool is this!? I love the look, too! Really cool idea. My hubby recently visited a home of a contractor who I believe used an old barn door to seperate an area of his home. I so want to do this in our dream home…Old doors are beautiful! blessedmamas last blog post..Swing music, wine & food…yeah, baby! I really love these barn style door! Cool! Kim Giffins last blog post..A Jolly Halloween Indeed! Thank you for posting this. I want to take an old prehung door and make it a pantry door. How to I hide the old door knob opening and the hinge cut outs on the end.